‘Farm Fresh North Carolina’ has arrived! Alpaca nuzzles Diane at Bedford Falls Alpaca Farm in Warne, Clay County. So it’s finally here! 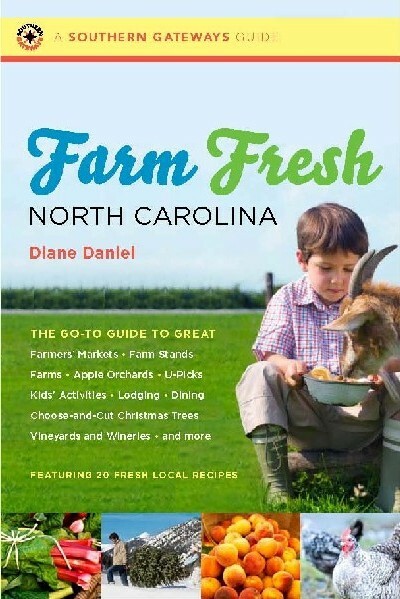 “Farm Fresh North Carolina,” my farm-travel guidebook to my home state, is now out, Both my hometown papers, the Durham Herald-Sun and the News & Observer, have written it up this week, with more articles across the state to follow! 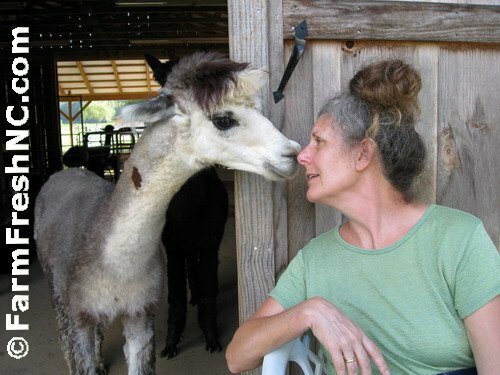 The N&O piece used one of my favorite photos — me being nuzzled by an alpaca at the state’s first alpaca farm, Bedford Falls. What a fun day that was, way, way west in Clay County, a part of North Carolina that often gets relegated to an annex on state maps. I fell in love with alpacas during my research, and included a few alpaca farms in the book. As for sales outlets, it’s available at the usual online spots and of course in stores all across North Carolina. Even NC Costco stores will start carrying the book in April! That is nuts (in a great way!) and a testament to how crazed the local-food movement has become. I pitched the idea for this book in 2007, the same year that “locavore” was named the New Oxford American Dictionary’s Word of the Year. My, how times have changed. If you want to know more about it, visit my “Farm Fresh North Carolina” website. And remember: Keep it Fresh in NC! This entry was posted on March 6, 2011 at 10:18 pm and is filed under Books, Environmental, Family travel, Farms, Food, North Carolina. You can follow any responses to this entry through the RSS 2.0 feed. You can leave a response, or trackback from your own site. Congratulations, Diane!! I’m so excited for you and the launch of your book! Thanks, K! I wish you could be here with me! Hi, Diane, we are so excited about your book! All the Counseling staff is coming tonight to meet you. We are from the North Carolina School of Sci. and Math. in Durham. On 5/18, 3:30 to 5, we are hosting and event called CELEBRATE NC! and we would love for you to come with your books to sell. Could you join us? Our students come to our residential, public school from all over NC, so we love it when someone highlights our state. See you tonight! Thanks, Gail. I”m honored! Will email you back directly. It is real astonishing that in a world of crisis and important medals that have been won with a difference of 0,01sec, the way back to basic pleasure has been made accesible.